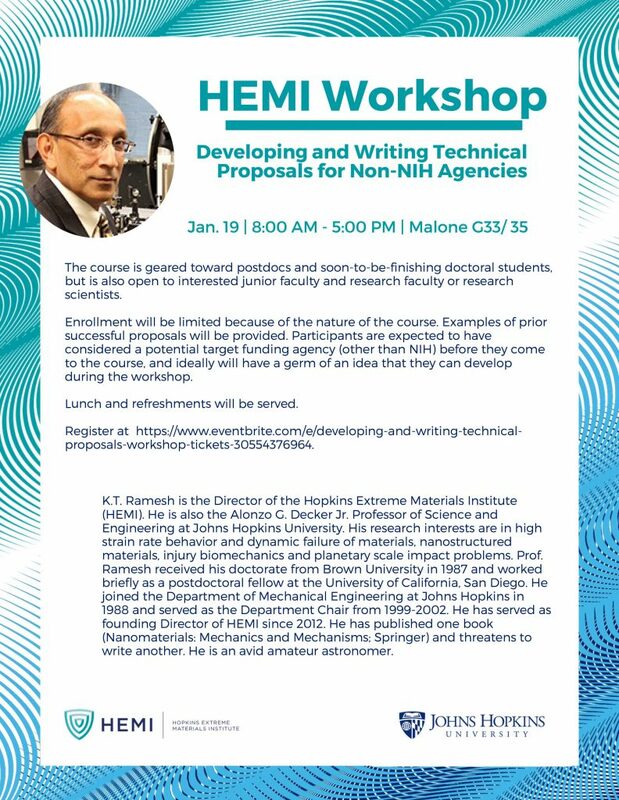 Professor KT Ramesh will be conducting a one-day workshop on “Developing and Writing Technical Proposals” focused on non-NIH agencies. The course is geared toward postdocs and soon-to-be-finishing doctoral students, but is also open to interested junior faculty and research faculty or research scientists. Enrollment will be limited because of the nature of the course. Examples of prior successful proposals will be provided. Participants are expected to have considered a potential target funding agency (other than NIH) before they come to the course, and ideally will have a germ of an idea that they can develop during the workshop. Questions? Contact Bess Bieluczyk at 410-516-7794 or via email at bess@jhu.edu.